Igor Stravinsky: (b Oranienbaum [now Lomonosov], nr St Petersburg, 5/17 June 1882; d New York, 6 April 1971). Russian composer, later of French (1934) and American (1945) nationality. One of the most widely performed and influential composers of the 20th century, he remains also one of its most multi-faceted. A study of his work automatically touches on almost every important tendency in the century’s music, from the neo-nationalism of the early ballets, through the more abrasive, experimental nationalism of the World War I years, the neo-classicism of the period 1920–51 and the studies of old music which underlay the proto-serial works of the 1950s, to the highly personal interpretation of serial method in his final decade. To some extent the mobile geography of his life is reflected in his work, with its complex patterns of influence and allusion. In another sense, however, he never lost contact with his Russian origins and, even after he ceased to compose with recognizably Russian materials or in a perceptibly Slavonic idiom, his music maintained an unbroken continuity of technique and thought. Michele Mangani, born in Urbino, was certified at “Gioacchino Rossini” Conservatory in Pesaro in Clarinet, in band instrumentation, composition, conductor and at “G.B. Martini” conservatory in Bologna in choral music and in choir director. In 1996 won the National Contest for conductor of the Italian Army National Band. He received a lot of National and International prizes and he is one of the most appreciated Italian composers. His compositions had been played and hacked around the world by different interpreters, orchestras and bands as: Wenzel Fuchs, Philharmoniker Berliner Orchestra main clarinet, Corrado Giuffredi, soloist clarinet of the Italian Symphonic Orchestra from Switzerland, Patrick De Ritis, 1° soloist bassoon of the Symphonic Orchestra from Wien, Ricardo Morales, main clarinet of the Philadelphia Orchestra, the Italian National Army Band, the Italian RN Music Band, the Financial Guard Military Band, the Symphonic of the Bulgarian Radio, the Philharmonic Orchestra from Bruxelles, The National Juvenile Orchestra from Spain, the Sinfonietta Orchestra from Losanna, the wind Octet of the Scala theatre. His music productions are more than 500 today, published by Eufonia Music Edition and his Opera are often inserted as obliged songs in execution contests, where he is often invited as jury commissioner or president. He is the wind Orchestra of Marche conductor and Professor of collection music for wind instruments at G. Rossini Conservatory in Pesaro. Since March 2017 he has been Director of the Musical Chapel Academy of SS. Sacramento in Urbino. Nino Rota: (b Milan, 3 Dec 1911; d Rome, 10 April 1979). Italian composer. He grew up surrounded by music: his mother Ernesta Rinaldi was a pianist and the daughter of the composer Giovanni Rinaldi (1840–95). At the age of eight he was already composing, and in 1923 a well-received performance of his oratorio L’infanzia di S Giovanni Battista established him as a child prodigy. In the same year he entered the Milan Conservatory, where his teachers included Giacomo Orefice. After a brief period of study with Pizzetti, he moved to Rome (1926), where he studied with Casella, and took his diploma at the Conservatorio di S Cecilia three years later. On the advice of Toscanini he studied at the Curtis Institute in Philadelphia (1931–2) with Rosario Scalero (composition) and Fritz Reiner (conducting). He formed a friendship with Aaron Copland and discovered American popular song, cinema and the music of Gershwin: all these elements were grafted on to his passion for Italian popular song and operetta. On his return to Italy, barely into his twenties, Rota attracted the attention of audiences and critics with a large body of music, predominantly chamber and orchestral works. At a time of open warfare between innovators and traditionalists (sustained by the mood established by the Fascist régime favouring warfare), Rota’s style, in part building on the example of Malipiero, displayed original characteristics. Works such as Balli (1932), the Viola Sonata (1934–5), the Quintet (1935), the Violin Sonata (1936–7) and his first two symphonies (1935–9 and 1937–41) show Rota’s trust in an unbroken link with the music of the past. This made Rota’s idiom exceptionally and uninhibitedly responsive to the widest variety of influences, supported, as it was, by a masterly technique, an elegant manner and a capacity for stylistic assimilation. His language at this time is strikingly different from the contemporary predominant directions in Italy. For example, the symphonies draw on a middle-European, Slav symphonic tradition (Tchaikovsky, but possibly Dvořák even more so), probably absorbed during his American period and already infused with cinematic mood. He contributed to the renewal of Italian music with a body of work that has an immediacy of gesture and is rooted in a rare lyricism, built on harmonic languages, formal structures and a rhythmic and melodic idiom which sound distinctive and original. Gianandrea Gavazzeni commented of the Sonata for flute and harp (1937) that he heard ‘the voice of an Italian Ravel, archaic, intimate, the voice of one who has invented a style that did not exist before’. After World War II, Rota’s critical fortunes altered considerably when, in the wake of the post-Webern movement, his work was increasingly judged to be anachronistic. This opinion was strengthened by his growing establishment as a film composer, held by many to be insignificant and uninvolved in the contemporary music scene. He continued, however, to write music for the concert hall and the opera house, with a constant cross-fertilization between the two areas: for a European composer this was an oblique, pioneering approach. In film music he used his eclectic inclinations and treated the boundaries of the film medium as a challenge, so producing some of the finest music of the genre. He became a lecturer at Bari Conservatory (1939), and later its director (1950–77). In 1942, Rota began his long collaboration with the Lux Film company, directed by, among others, Guido M. Gatti and Fedele D’Amico. He created the music for around 60 films in ten years by such directors as Renato Castellani (Mio figlio professore, Sotto il sole di Roma), Mario Soldati (Le miserie del signor Travet), Alberto Lattuada (Senza pietà, Anna) and Eduardo De Filippo (Napoli milionaria, Filumena Marturano). In 1952, with Lo sceicco bianco (The White Sheik), he began an association with Fellini which lasted until the composer’s death. Of their 16 films, some achieve an extraordinary marriage of music and image, such as I vitelloni, La strada, La dolce vita, 8½, Amarcord and Il Casanova di Federico Fellini. Although it is generally thought that the director dominated the composer, the situation was more subtle and problematic as the music was required to fulfil a narrative and psychological role, frequently featured at the expense of the text itself. Fellini’s film style owes a great deal to Rota’s virtuosity, adaptability and insight. Examples include the many circus marches inspired by Julius Fučík’s Einzug der Gladiatoren and the engaging parody of Weill’s Moritat von Mackie Messer in the theme of La dolce vita. In addition, Rota’s tendency to quote, sometimes to the point of plagiarism – the theme for Gelsomina in La strada is based on the Larghetto of Dvořák’s Serenade, op.22 – was a genuine inclination which converged with Fellini’s imagery, to the point where it identified with it and lent it dignity. Rota’s film career, amounting to over 150 titles, included collaborations with Luchino Visconti (Rocco e i suoi fratelli and Il gattopardo [The Leopard]) and directors such as René Clément, Franco Zeffirelli, King Vidor, Sergei Bondarchuk, as well as on the first two parts of Francis Ford Coppola’s The Godfather. Rota composed in a wide variety of genres, writing pieces of an almost provocative simplicity. His Ariodante (1942), audaciously 19th-century in manner, was followed by works reminiscent of operetta and vaudeville, such as I due timidi (1950), La notte di un nevrastenico (1959) and the overwhelming farce Il cappello di paglia di Firenze (1955). These works show an ability to produce instant sketches which the composer himself described as the product of his familiarity with the rhythm of film-making. Another favoured genre was that of the fairy tale as in Aladino e la lampada magica(1968) and La visita meravigliosa (1970), considered perhaps his finest score for the theatre. The most significant orchestral works are the 3 piano concertos, the Sinfonia sopra una canzone d’amore (1947), the Variazioni sopra un tema gioviale (1953), Symphony No.3 (1956–7) and several concertos for various instruments. His piano and chamber music includes many original compositions, such as the 15 Preludes or the Due Valzer sul nome di Bach for piano (1975; re-used in Casanova), the Violin Sonata (1936–7), the String Quartet (1948–54), two trios (1958 and 1973) and a nonet (1959–77). His vocal music includes the oratorio Mysterium (1962) and the rappresentazione sacra, La vita di Maria (1968–70), in which a style derived in part from the neo-madrigalist manner of such composers as Petrassi and Dallapiccola results in an operatic-sounding eclecticism, with influences filtered through Stravinsky but rooted in other Eastern European styles (Musorgsky, for example). Rota had frequent recourse to self-borrowing, increasingly apparent in the later film music and stage works. As a whole, Rota’s work is a dense web of continual, multiple references where – in line with the composer’s declared intention – film music and art music are allowed equal dignity. As early as Il cappello di paglia di Firenze he drew together material from preceding works, but it is particularly in a masterpiece like the ballet La strada (1966) and in the opera Napoli milionaria (1977) where self-quotation becomes a point of synthesis and revelation of his essential style. His first film score for Fellini, Lo sceicco bianco, stands out as a source-composition, a model of one of Rota’s specific musical languages; other scores for Fellini as well as Il cappello di paglia, Il giornalino di Gian Burrasca and the incidental music for Much Ado about Nothing draw material from it. La strada makes use of themes from many works, including Lo sceicco bianco, Le notti di Cabiria, Rocco e i suoi fratelli, Concerto soirée and 8½, while Napoli milionaria uses quotations from Filumena Marturano, Plein soleil, La dolce vita, Rocco e i suoi fratelli and Waterloo. Rota’s uninhibited language corresponds in aesthetic terms to this flood of quotation, and the two aspects offer new definitions of such terms as ‘new’ or ‘originality’. Domenico Calia (Clarinet): Domenico Calia is a polyhedral performer with a great repertoire ranging from classical music to modern and contemporary one, expert of the most innovative instrumental techniques. He was born in 1985 and as a child he studied clarinet. Under the guide of M° Vittorio Luna, he graduated at the Conservatory V. Bellini of Caltanissetta. When he was eighteen years old, he face the professional world by performing the Mozart’s Gran Partita with the Istituzione Sinfonica Abruzzese so gaining many prizes at the 3° Concorso Nazionale Città di Balestrate, 7° Concorso Nazionale Giovani Musicisti Città di Caccamo, 1° Rassegna Nazionale di Musica Città di Balestrate, 2° Concorso Nazionale di Musica (Premio Mauro Patti) Città di Gangi, 1° Premio al Concorso Musicale Internazionale Carlo Agresti – Grancia Certosina di Salerno. He specialized with Giuseppe Garbarino, Vincenzo Paci, Angel Jean Cino, Massimo Scorretti, Italo Capicchioni, Cristian Chiodi Latini, Antonino Lampasona and Crescenzo Langella. He took part, as firt clarinet, to the International Seminar of Orchestral Formation of the Estate Musicale Frentana, from 2002 to 2005. He has been invited in many conservatories and festivals as jury commissioner, soloist and teacher, giving many masterclasses of high specialization. He has performed together with artists such as Marco Pierobon, Milva, Andrea Noferini, Nina Beilina, Ettore Pellegrini and with conductors like Donato Renzetti, Vlad, Massimiliano Caldi, Daniel Agiman, Rafail Pylarinos, Angelo Sormani, and many others. He has collaborated with Istituzione Sinfonica Abruzzese, Teatro Massimo (Palermo), Orchestra Alessandro Manzoni (Milan), Multipromo Opera Festival (Florence). He has done many recordings among which his appreciated debut album “Works for Contemporary Clarinet” (Da Vinci Classics, 2017), where he shows his virtuosity and interpretative ability and that has received the total approval of the critics and the 5 stars by the magazine Musica (Roberto Zecchini) and by Musicvoice.it (Andrea Bedetti). 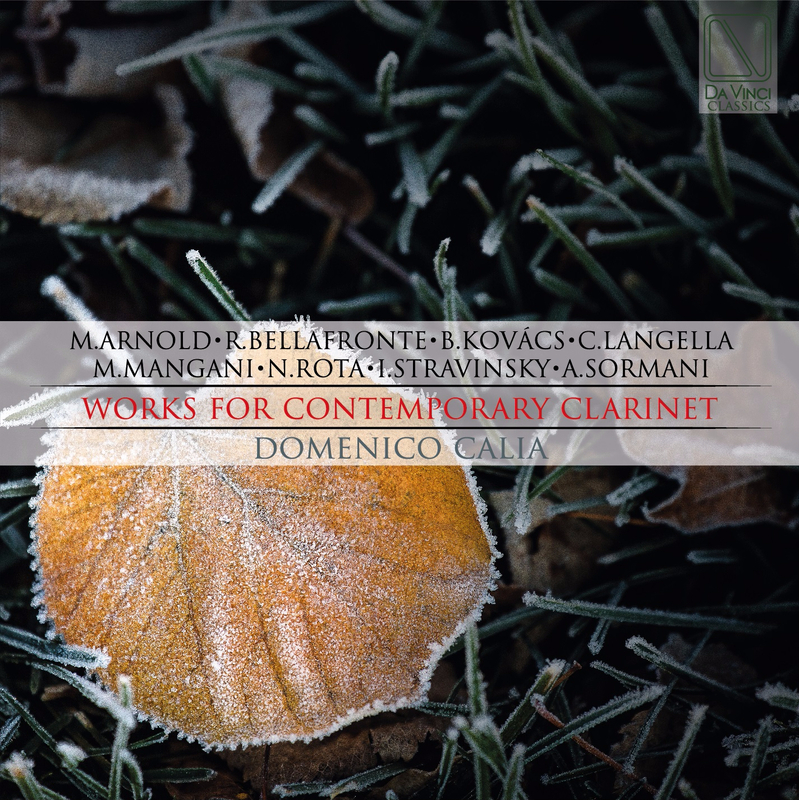 His “Flowers of Contemporary Clarinet” (Da Vinci Classics, 2018) has highlighted some gems by some Italian living composers. He is the artistic director of Da Vinci Association and of Clarinettando Italia Festival.